For Twice in a While, Jess Wheelock and Cara Levine illustrate the exhaustion of endurance at Royal Nonesuch gallery. Jess Wheelock's works speak to the anxiety-inducing circumstances we encounter in our everyday lives. In Jess Wheelock's piece "Pushing Back Avalanches," a compilation of avalanche videos is projected onto a wall in front of a bicycle pump. When the viewer compresses the pump, the sound of an inhale plays loudly, and the avalanche rewinds, moving backward up the mountain. The pump provides temporary hope for surviving the simulated snow, but ultimately no one can keep pumping forever ­— arms grow tired. One has to let go, and let the hypothetical avalanche roll over them. The piece evokes the feeling of an impending panic attack, and an attempt to stave it off with deep breaths. It's one of many such pieces that trudge through mental and emotional landscapes in Twice in a While, a show currently on view at Royal Nonesuch (4231 Telegraph Ave., Oakland), which also features works by Cara Levine. By translating those headspaces into video work, the two artists invite viewers into their personal experiences with anxiety and relief. Another of Wheelock's works shows her balancing a towering stack of books that were assigned to her in graduate school. Left alone, the video loops — with the stack threatening to tumble at any moment. 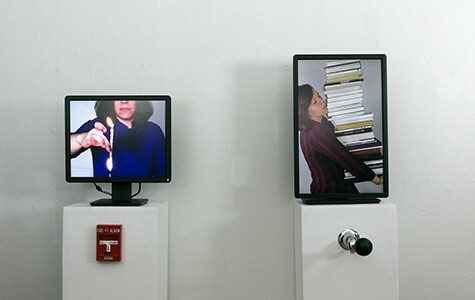 But the books don't fall until the viewer squeezes a horn mounted in front of the video projection, which cues Wheelock's collapse under the weight of her required reading. Similarly, in "Burning the Candle at Both Ends," Wheelock holds a dripping candle in front of her as two flames appear to grow nearer to her burning fingers at the center. The pull of a fire alarm beneath the video triggers a wave of water to put out the flame and soak Wheelock in the process. The interactive videos speak to those anxiety-inducing circumstances we encounter in our everyday lives. In offering Wheelock relief, the viewer experiences that relief vicariously, even if only for one fleeting, therapeutic moment. 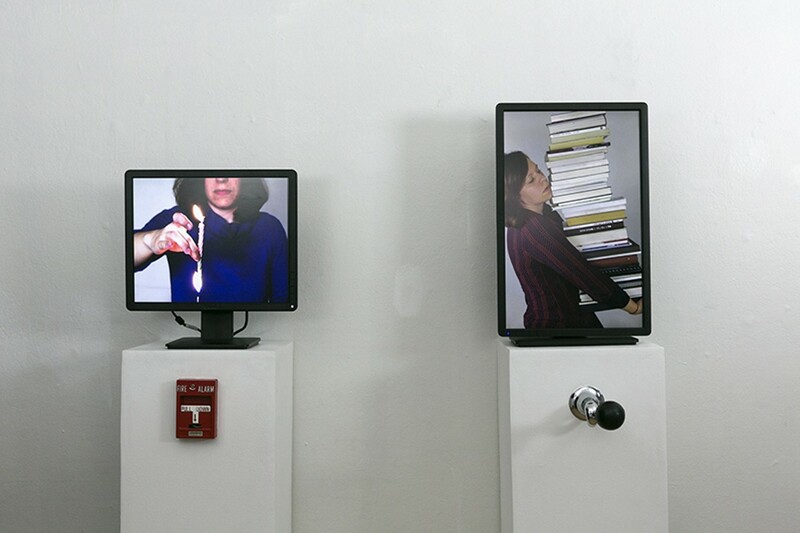 While Wheelock's work expresses emotional struggle through physical analogies, Levine's work could be read as doing the opposite. Levine suffers from chronic migraines, and practices yoga and meditation in order to get through them. Her two-channel video piece, "Re-Mother: What is Love's True Perspective," shows various sharp-edged polygons made of blue paper, in front of a blue backdrop. Eventually, hands penetrate the space through black holes and begin moving around the shapes until a big, black-and-white zigzag disrupts the entire scene. The work poetically illustrates Levine's experience of physical pain, and her attempts to mentally suppress it. While inspired by personal struggles, Twice in a While manages to articulate the constant effort that is required to exist in the world, and that is often hidden by attempts to seem — for lack of a better word — effortless. That mysterious reservoir of existential motivation, which is a resource in all of our actions, in fact very often threatens to run dry. This show bravely acknowledges that limitation.